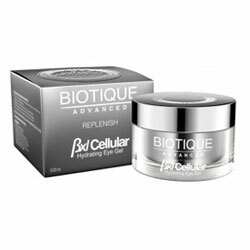 Buy Biotique Advanced BXL Cellular Hydrating Eye Gel - 100% Natural Diminishes Dark Circles, Deflates Puffiness, Minimizes Fine Lines. This cool hydrating eye gel diminishes dark circles, deflates puffiness, minimizes fine lines and erases signs of fatigue for a younger appearance. Powered by exclusive BXL Complex for the most energizing, nourishing and strengthening skin effects. Apply a small amount around eyes, and under brow bones, with gentle tapping motions. AM and PM.